On Sermons in Song, Braxton D. Shelley & Testimony blend the austerity of a concert choir with the swagger of a gospel choir. The result is a five-star project that deserves major label attention. As musician, songwriter, musicologist, and the album’s narrator, Dr. Shelley puts in practice the techniques of such top-shelf artists as Kurt Carr, Richard Smallwood, and Patrick Lundy to create a lushly textured choir project. Reminiscent of the annual Gospel Music Workshop of America Mass Choir albums, Sermons in Song features one soloist after another, rendering songs that run the gamut from high church to down-home gospel workout. Like the GMWA collections, this CD was recorded live—in this case, at the Mt. Level Missionary Baptist Church in Durham, North Carolina. True to its title, the songs are based on scriptural passages, particularly those most meaningful to Dr. Shelley, who wrote all the songs on the project. Most are songs of praise and thanksgiving, though “Don’t Faint” (featuring Teeshawn Jones) uses Galatians 6:9 to encourage listeners to never give up. One of the album’s highlights is “Kept,” a song with the restful righteousness of a Roberta Martin Singers selection. Charletta Hines serves as the church-trained singer on this neo-traditional selection as the organ supports her with flourishes of old-school warbling. A bounty of craggy squalls from the Reverend Avis Graves on “I Owe You Praise” tees Braxton up to offer a few words on praise that send the live recording audience into praise break. “Worthy” is a majestic ballad lovingly rendered by soloist G. Preston Wilson Jr. that fades before the anticipated big tonic chord finish. Michael Alexander tackles challenging low notes at the start of “Thank You” but recovers to deliver a song reminiscent of Walter Hawkins’ “Thank You Lord.” The opener, “He Is Good,” sets the album’s tone in its dramatic demeanor. For those who like their gospel music with more gravitas and less gimmick, this album is for you. A native of Rocky Mount, North Carolina, home of the Barnes Family, Dr. Shelley is an ordained minister and an assistant professor in the Department of Music and the Stanley A. Marks and William H. Marks Assistant Professor in the Radcliffe Institute for Advanced Study at Harvard University. His dissertation is titled Sermons in Song and focuses on the work of Richard Smallwood, so it’s small wonder that Smallwood’s exquisite touch is all over this CD. 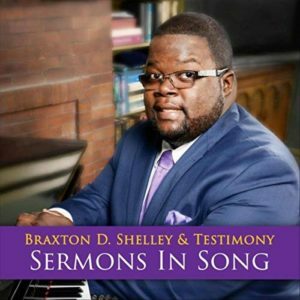 The post Braxton D. Shelley & Testimony – Sermons in Song appeared first on The Journal of Gospel Music.